Very Basic Heraldry Part One – Why Have a Coat of Arms? Heraldry is (in part) the study and creating of coats of arms. A coat of arms, in its simplest form, is a personal design on a shield that identifies the knight that carries that shield. Why was this even necessary? Because from far away a bunch of knights in armor all look the same. It would be hard to tell who was who. You could compare that to trying to watch a football or soccer game where nobody was wearing a name or a number and you were too far away to see the players’ faces. When a knight had a coat of arms painted on his shield, other people could recognize him right away. 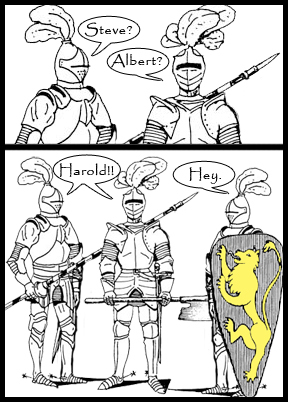 So knights and others would come up with their own personal coat of arms. They would have different colors or shapes or patterns or animals on their shields. Or maybe they would have different colors of shapes AND patterns AND animals. But whatever they chose, it had to be different from everyone else’s shields. Coming soon…Very Basic Heraldry Part Two – Variations, Animals, Colors and Metals.